The Global Server Component enables you to use full-featured local, regional, and international carriers that are outside of our existing carrier portfolio. This highly customizable component allows you to meet carrier specifications by exercising full control over services and business rules that your carrier requires. Think of the Global Server Component as a framework for creating new carriers. You add information specific to your carrier into the framework and it can then be used just like UPS, FedEx, or any of the other carriers we provide. 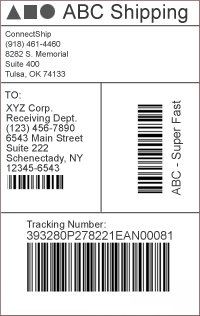 Information you provide may include shipping rates, shipping label requirements, tracking number formats, or rules to determine if the type of shipment you are requesting is allowed by the carrier. and you get the corresponding carrier's shipping label in response. But after you have created a new carrier with the Global Server Component, you instead send the name of your custom carrier and service, for example "ABC Super Fast", and you get your customized ABC shipping label in response. Notice the customized shipping label pictured here. The Global Server Component includes our Custom Documents module which allows you to create not only shipping labels but also other documents such as packing lists, invoices, or pick tickets. After you have shipped your packages for the day, you can electronically transmit a package manifest to your new carrier using the Global Server Component. This transmitted manifest can be formatted to meet your carrier's specifications and sent via FTP or HTTP. You can also print any other documentation the carrier requires by using the Custom Documents module. Once you have configured a new carrier with the Global Server Component framework, you can quickly enable all of your shipping locations to use that carrier with minimal changes.